People were left in serious shock after a President openly confessed that he stabbed someone to death as a teenager. 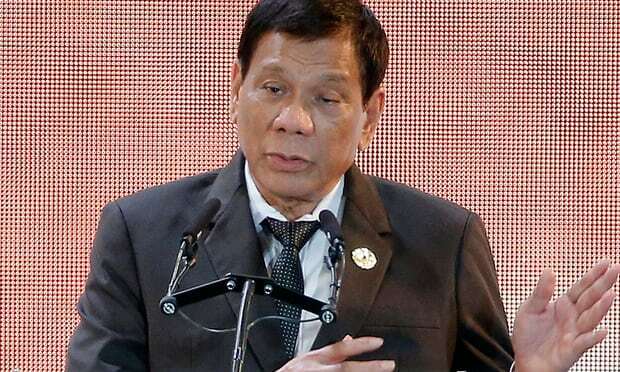 Philippine President Rodrigo Duterte has said he stabbed a person to death as a teenager, in a defiant speech to promote his drug war ahead of a summit of world leaders in Manila, according to a report by AFP. He made the claim yesterday while speaking to the local Filipino community in the Vietnamese city of Danang. He used obscene language to hit back at critics of his deadly drugs crackdown. “When I was a teenager, I would go in and out of jail. I’d have rumbles here, rumbles there,” said Duterte, who is in Danang for the Asia-Pacific Economic Cooperation (Apec) summit. Duterte won last year’s presidential elections after promising to eradicate illegal drugs with an unprecedented crackdown that would see up to 100,000 people killed. Since he took office 16 months ago, police say they have killed 3,967 people in the crackdown. Another 2,290 people were murdered in drug-related crimes, while thousands of other deaths remain unsolved, according to government data. Duterte, 72, remains popular with many Filipinos who believe he is making society safer. But critics at home and abroad warn that he is orchestrating a campaign of extrajudicial mass murder, carried out by corrupt police and hired vigilantes. Duterte denies the allegations. The firebrand leader consistently generates headlines for his abusive language and incendiary comments defending the drug war. Duterte said last year he would be “happy to slaughter” three million drug addicts and branded then US president Barack Obama a “son of a whore” for criticising the drug war. Duterte also said in December last year that he had personally shot dead criminal suspects when he was mayor of southern Davao city to set an example to police. His spokesman later sought to clarify the remarks, saying those killings were during a “legitimate police action”.